It’s no secret that the trucking industry has its fair share of controversy and polarizing issues. Whether it’s the new ELD mandate forcing truckers to cut back on costs to implement a new technology, or the driver shortage playing a huge impact on the industry itself, truckers are faced with a variety of major issues every single day. Drivers can often feel lost and alone in the industry. Owner operators may feel like they’re trying to climb a mountain all on their own, while company drivers often feel like they’re just another nameless employee. This is why it’s important to consider the benefits of a truckers union. Below we’ll break down what a truckers union entails as well as the variety of benefits of a truckers union. What is a Truckers Union? Before we can get into the various benefits of a truckers union, it’s important to understand what exactly it entails. A union is essentially a group of workers that band together in order to make decisions about his or her work conditions. This includes but is not limited to wages, work environment, benefits, and hours. Common sense says that a united group of people is often for powerful and has a bigger influence than a few scattered individuals. A truckers union is a group of workers in the trucking industry that band together in order to make decisions about their working conditions. Unions work like a democracy. They hold elections for officers who make decisions on behalf of members, giving workers more power on the job. Most unions will have a national board, as well as regional chapters. Joining a truckers union isn’t just about joining a group of like-minded individuals, it’s actually a great way to increase your way of life. Truckers unions will allow your voice to be heard. It will also give truckers the chance to make major changes in the industry. It’s proven that union members usually make a higher wage. According to the U.S. Department of Labor reports that wages of union members are, on average, 27 percent higher than those of workers who do not have union representation. Numerous studies have also shown that union members make an average of $200 hundred more a week than a non-union employee, according to the Bureau of Labor Statistics. Did you know that a good amount of trucking companies don’t offer health insurance? With the health insurance landscape on rocky ground, many truckers are forced to pay for pricey private insurance. However, a truckers union can actually provide stellar healthcare in many cases. The quality of the insurance offered depends on what’s available in your area. It also depends on your employer’s actual ability to cover their end, and the strength of your local truckers union. Sometimes joining a truckers union isn’t even about the tangible benefits like higher wages or health coverage. One of the biggest benefits of a truckers union is the ability to air your grievances when you like you’ve been wronged by a trucking company. Most unions will have legal representation. This is in case you feel like your company is taking advantage of you or engaging in an illegal tactic. Of course, each company has set agreements with the truckers union on how concerns are to be addressed. Some will allow for direct contact with management. Others will insist you go through your chain of command. It’s important to highlight the biggest union in the nation, the Teamsters Union. 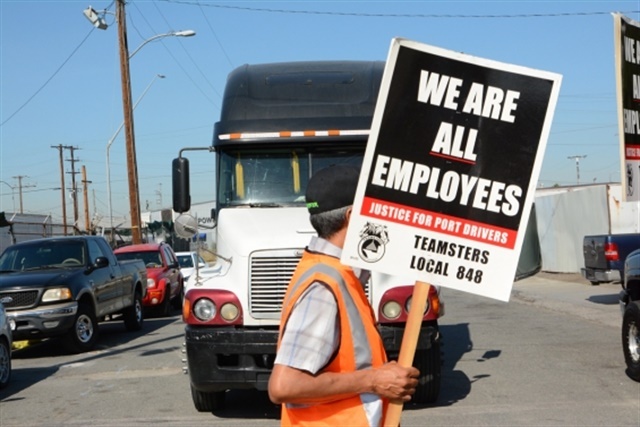 The Teamsters Union is made up of 1.4 million workers who are employed in a variety of public and private industries. While you certainly can join your local trucking union, or even create your own, it’s important to know that there’s an already established union that will take care of the legwork. For Americans all across the country truckers unions have done a lot of good for the employee and for the overall trucking industry. However, they are far from being the perfect answer to addressing each and every concern. Like any organization, you’re always going to have issues internally. At the end of the day, you’ll most likely have another person speaking for you. Make sure you’re selecting the right people. Are you in a union? What are your thoughts on trucking unions? Comment below!